Jesus posed the question to his disciples a short time before he was unfairly accused, and wrongfully condemned to death after being subjected to a mockery of a trial...before he was horrendously abused and killed atop a wooden cross. Peter, the disciple who was to initiate and lead the astounding movement we know today as Christianity answered, "You are the Son of the living God"...to which Jesus replied, "You are Peter, and upon this rock I will build my Church and the gates of hell will not prevail against it!" Jesus' question reverberates throughout history, as we know it and, directly and indirectly, people have answered, and continue to respond to this most poignant of inquiries. Let us endeavor, in this regard, to peer into the thoughts of over a thousand notable men and women from the first century following Christ's life and times to the present age. Let us read what monarchs, presidents, statesmen, philosophers, scientists, theologians, writers, philanthropists, poets, composers, singers, songwriters, actors, actresses, television talk-show hosts, athletes, and Christian martyrs throughout history among others, and even a dictator or two and a few infamous personalities, have had to say about this mesmerizing young rabbi who wandered the Judean hills over two thousand years ago. 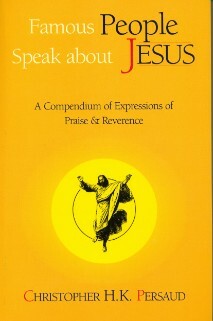 Order a copy of Famous People Speak About Jesus from www.Xlibris.com/Bookstore today. 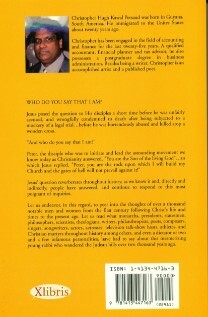 You can also order from www.barnesandnoble.com, www.amazon.com or from your local bookstore. Click on the HOME tab at top of the page for author contact information and for URLs of author's other websites.